Do you love this adorable mini chocolate bundt cake? Today I am sharing this recipe for a chocolate bundt cake. Teacher Appreciation is the perfect chance to say “Thank You!” to our favorite teachers, librarians, and school staff. A small cake, cupcake or mini bundt cake is a perfect gift. The cake is the way to my heart after all. 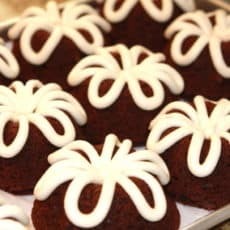 For Teacher Appreciation I love mini bundt cakes because the recipe is easy enough for the kids to help… always a bonus. It’s a treat that seems special and fun. Here’s how to make them. First of all, you won’t need a chocolate glaze or chocolate ganache. This recipe is so easy because it starts with a cake mix. Also, a pudding mixes makes it nice and moist. Make this delicious easy mini bundt cake. This is the perfect icing to put on top of the cake. Simple frosting recipe perfect for cakes and cupcakes. Mix together till smooth. Add coloring if desired. I usually leave it white for Bundt Cakes. I love to give the mini bundts in a small gift box, just to make it feel a little fancy. And speaking of fancy how about flowers on top? Is that too much? Not for me. And since no gift would be complete without a tag. I’ve created a sweet little printable just for you. Click here for the You Take the Cake Tags. Do you love this adorable mini chocolate bundt cake? This adorable tag is a perfect way to thank your teachers for teacher appreciation week! Hello, I am making these as I type. They will end up being mini volcanoes with red and orange frosting. My question, 1 and 1/3 cup oil, is that right? Seems like a lot! I'm a teacher and I have four sons. Every year at parent-teacher conferences (long, long days for teachers! ), I bring a treat to my sons' teachers. I love your idea of the mini-bundt cake, so I paid $1 per box and about $.30 per cake and gave them to the teachers. I even tied a plastic fork onto the ribbon, so they could dig right in. Thanks for the idea! charming gift cake, the ingredients are so simple. Where did you get the boxes for your cakes? How many cakes per box? I wanted to thank you for sharing such a cute idea! I totally "borrowed" it for teacher appreciation treats this year :) They were a big hit!! What font did you use on "You Take the Cake"? I love it!! So adorable. I love everything that Calli does. What a great idea! I always rack my brain trying to find something different and new, and this is a nice idea!